MOVIES - From Variety: "Moonlight" to expand to 1500 theaters after its "Best Picture" win at Sunday's 89th Academy Awards. STAR TREK - From THR: CBS CEO Les Moonves says that "Star Trek Discovery" will debut late summer or early fall. OBIT - From YahooMovies: The 7-foot-7 actor Neil Fingleton has died at the age of 36. Great Britain's tallest man, he was best known for playing "Mag the Mighty" on "Game of Thrones." MOVIES - From BleedingCool: "Bright" is Will Smith's new film, and it has a trailer. BOX OFFICE - From BoxOfficeMojo: The winner of the 2/24 to 2/26/2017 weekend box office is "Get Out" with an estimated total of $30.5 million. From THR: A closer look at the 89th Oscar that were overshadowed by the Best Picture fiasco. From YahooMovies: And the winner isn't... "La La Land" "Moonlight" correctly announced as "Best Picture" Oscar winner after a historic gaffe. From YahooCelebrity: This picture is worth a thousand words... the look on their faces over the "Best Picture" Oscar fiasco. From YahooMovies: No, "Moonlight" won. From YahooMovies: Warren Beatty explains his part in the "Best Picture" Oscar fiasco. From Polygon: Yeah, "Suicide Squad" has an Oscar. From Variety: Stars make political statements on the Oscar red carpet, including support for the ACLU and in remembrance of Trayvon Martin. From YahooNews: "Good Morning America" offers an extended video interview with Viola Davis. OBIT - From Variety: The actor Bill Paxton has died at the age of 61, Saturday, February 25, 2017. Paxton's long career included appearing in several James Cameron films, including "Aliens" and "Titanic." He was one of my favorites; I send my prayers to his family. From THR: Hollywood mourns acclaimed film and television actor, Bill Paxton. OBIT - From TheWrap: Judge Joseph Wapner has died at the age of 97, Sunday, February 26, 2017. Wapner was the original judge on the long-running, syndicated courtroom series, "The People's Court." POLITICS - From YahooNews: President Trump skipping annual White House Correspondents Association Dinner on April 29th. Heat-kitchen, man. BLM - From YahooCelebrity: Muhammad Ali's son, 44-year-old Muhammad Ali, Jr. was detained at at a Florida airport for several hours... because of his Arabic-sounding name. AWARDS - From Variety: The winners of the Frances's 2017 Cesar Awards announced. ANIME - From CBR: Hayao Miyazaki comes out of retirment... again. He is apparently directing a film entitled "Boro the Caterpillar." COMICS-FILM - From ComicsAlliance: X-Men writer-producer Simon Kinberg says that "Gambit" moving could begin filming in 2018. COMICS - From BleedingCool: Batman will meet "Rorschach" of "The Watchmen." TELEVISION - From Variety: Freddie Highmore ("Bates Motel") to star in ABC pilot, "The Good Doctor." TELEVISION - From TheWrap: Starz TV adaptation of Neil Gaiman's seminal novel, "American Gods," is set for April 30th, 2017. COMICS-FILM - From YahooMovies: After various swings of fortune, Matt Reeves has signed a deal to direct "The Batman" movie starring Ben Affleck. MOVIES - From THR: Angelina Jolie is still hot, landing acting and directing gigs. Her latest directorial endeavor, "First They Killed My Father," has had its premiere. OBIT - From THR: Leah, the mother director Steven Spielberg, has died at the age of 97, Tuesday, February 21, 2017. COMICS-FILM - From Deadline: Jamie Chung has been cast as "Blink" in Fox/Marvel's X-Men themed pilot. MOVIES - From Variety: Another "Game of Thrones" star has a new job. Alfie Allen is part of "The Predator" reboot. COMICS-FILM - From Variety: "Game of Thrones"star Iwan Rheon has been cast as the lead in ABC/Marvel's "Inhumans." TELEVISION - From YahooTV: Demi Moore will have a recurring role in Season 4 of FOX's "Empire." MOVIES - From YahooMovies: While filming in Europe, Jamie Foxx is apparently the target of racial slurs at a restaurant. COMICS-FILM - From BleedingCool: A dinner and hints at shooting a new X-Men flop starting Summer 2017. From Movieweb: Will Simon Kinberg make his directorial debut with this next X-Men movie a.k.a. "X-Men 7?" OBIT - From THR: Cinematographer Gerald Hirschfeld died at the age of 95, Monday, February 13, 2017. Hirschfeld may be best known for his beautiful black and white photography on Sidney Lumet's "Fail-Safe" and Mel Brooks' "Young Frankenstein." HISTORY - From DemocracyNow: George Takei speaks on the 75th anniversary of the order to place Japanese Americans in internment camps during World War II. Takei, then 5 years-old, was placed in a camp with his parents and siblings. BOX OFFICE - From BoxOfficeMojo: The winner of the 2/17 to 2/19/2017 weekend box office is "The LEGO Batman Movie" with an estimated take of $34.2 million. AWARDS - From Variety: Cinema Audio Society Awards announced with "La La Land" and "Game of Thrones" leading wins. MUSIC - From Vulture: Drake does not want his two weird "Grammy" wins from the 2017 Grammys a week ago. From Vulture: Black artists don't win Grammy "Album of the Year," not often - been 10 years. From Vulture: And Neil Portnow loves his head in the sand. Grammys are overrated anyway. COMICS - From Vulture: Warren Ellis talks about the rebirth of Jim Lee's WildStorm as "The Wild Storm." From Patreon: Here is my review of "The Wild Storm #1." COMICS - From THR: Trailblazing editor Karen Berger, who brought Neil Gaiman (The Sandman) to DC Comics, has signed a deal with Dark Horse Comics, trailblazing independent comics publisher. COMICS-FILM - From Variety: So maybe Matt Reeves won't direct Ben Affleck-Batman movie. MOVIES - From TheWrap: He's playing young Lando and now, Donald Glover will play "Simba" in a live-action version of "The Lion King." From YouTube: "Prologue: Last Supper" from "Alien: Covenant," which is due May 19, 2017. The 89th Oscars nominations were announced on Tuesday, January 24, 2017. Oscars for outstanding film achievements of 2016 were presented on Sunday, February 26, 2017, at the Dolby Theatre® at Hollywood & Highland Center. The ceremony was televised live on the ABC Television Network at 7 p.m. ET/4 p.m. PT and was hosted by Jimmy Kimmel. San Francisco, CA – VIZ Media, LLC (VIZ Media), a premier company in the fields of publishing, animation distribution, and global entertainment licensing, delights fans with news of preorders for the forthcoming home media release of ONE-PUNCH MAN on April 25th, 2017. The first release of the popular anime series about an unlikely superhero with a knockout punch will debut as a Blu-ray/DVD Combo Pack, a Standard Edition Blu-ray and a Standard Edition DVD set. Each edition will feature Episodes 1-12 and will contain both English dubbed and original Japanese (with English subtitled) dialogue selections. Preorders are available now from a variety of leading outlets and online retailers. Fans that order the ONE-PUNCH MAN Limited Edition Combo Pack from RightStufAnime.com will receive a special gift with purchase – while supplies last. To view a trailer for the forthcoming ONE-PUNCH MAN release, please visit: youtube.com/watch?v=0xC5RSDrVSs. The ONE-PUNCH MAN Blu-ray/DVD Combo Pack will carry an MSRP of $59.99 U.S. / $69.99 CAN; the Standard Edition Blu-ray Set will carry an MSRP of $49.99 U.S. / $57.99 CAN; the Standard Edition DVD-only Set will carry an MSRP of $39.99 U.S. / $52.99 CAN. The ONE-PUNCH MAN Blu-ray/DVD Combo Pack contains a deluxe, four-disc collection (two DVDs & two Blu-ray discs), packaged in an exclusive chipboard box with specialty printing. The Combo Pack also includes six exclusive OVA anime shorts (only available on the Blu-ray Edition and the Blu-ray/DVD Combo Pack) as well as six full-color collectible art cards and a premium full-color booklet featuring episode summaries, character profiles, interviews and more. Blu-ray episodes are presented in crisp 1080p HD video. The ONE-PUNCH MAN Standard Edition Blu-ray also features episodes in 1080p HD video and also contains the six exclusive OVA anime shorts. The ONE-PUNCH MAN Standard DVD Set features two discs with beautifully illustrated O-card packaging and specialty foil printing. Episodes are presented in 480p standard video format. The ONE-PUNCH MAN anime series centers on Saitama, a man who only became a hero for fun. However, after three years of “special” training, he finds that he can beat even the mightiest opponents with a single punch. Though he faces new enemies every day, it turns out being devastatingly powerful is actually kind of a bore. Can a hero be too strong? For more information on ONE-PUNCH MAN or other award-winning anime titles from VIZ Media, please visit VIZ.com. Oscar® nominees Lin-Manuel Miranda, Sting, Justin Timberlake and 2014 Oscar winner John Legend will perform at the 89th Oscars® ceremony, show producers Michael De Luca and Jennifer Todd announced today. Hosted by Jimmy Kimmel, the Oscars will air live on Sunday, February 26, 2017 on the ABC Television Network. “We’re thrilled to welcome these world-class artists to the Oscars. These performances will not only celebrate the five extraordinary nominated original songs, but also the integral part music plays in movies,” De Luca and Todd said. Seventeen-time Grammy winner Sting will perform “The Empty Chair” from “Jim: The James Foley Story,” the Oscar nominated song he co-wrote with three-time Oscar nominee J. Ralph. In addition to this current nomination, Sting has been nominated in this category on three previous occasions; “You Will Be My Ain True Love” from “Cold Mountain” (2003), “Until” from “Kate & Leopold” (2001) and “My Funny Friend And Me” from “The Emperor’s New Groove” (2000), which he shared with David Hartley. A 2014 Kennedy Center Honoree, Sting has sold over 100 million records. Timberlake will perform his Oscar-nominated song “Can’t Stop The Feeling” from the movie “Trolls.” He shares music and lyric credits with Max Martin and Karl Johan Schuster. Timberlake is a multi-platinum recording artist and actor whose numerous awards include nine Grammy Awards and four Primetime Emmy Awards. His acting credits include the Oscar-winning film “The Social Network” (2010) and Oscar-nominated “Inside Llewyn Davis” (2013). Legend will perform both “Audition (The Fools Who Dream)” and “City of Stars,” from “La La Land,” music by Justin Hurwitz; lyrics by Benj Pasek and Justin Paul. A singer-songwriter, musician and actor, Legend won an Oscar for the original song “Glory” from “Selma” (2014), an honor he shared with artist Common. Legend’s many accolades also include 10 Grammy Awards and 28 nominations. The 89th Oscars will be held on Sunday, February 26, 2017, at the Dolby Theatre® at Hollywood & Highland Center® in Hollywood, and will be broadcast live on the ABC Television Network at 7 p.m. ET/4 p.m. PT. The Oscars, produced by De Luca and Todd and hosted by Jimmy Kimmel, also will be televised in more than 225 countries and territories worldwide. Additionally, “The Oscars: All Access” live stream from the red carpet and backstage will begin at 7 p.m. ET/4 p.m. PT on Oscar.com. BURBANK, Calif.--(BUSINESS WIRE)--Warner Bros. Pictures announced today that Matt Reeves (“Dawn of the Planet of the Apes,” “Cloverfield”) has been set to direct “The Batman.” Reeves will also serve as a producer on the new standalone action adventure centering on one of DC’s most enduringly popular Super Heroes. The announcement was made by Toby Emmerich, President and Chief Content Officer, Warner Bros. Pictures Group. Batman was created by Bob Kane with Bill Finger. “The Batman” will be distributed worldwide by Warner Bros. Pictures, a Warner Bros. Entertainment Company. Producers Michael De Luca and Jennifer Todd today announced the second slate of presenters for the 89th Oscars® telecast. Hosted by Jimmy Kimmel, the Oscars will air live on Sunday, February 26, 2017 on the ABC Television Network. "These actors are why we love to go to the movies," said De Luca and Todd. "From blockbusters to art house films, these artists deliver every time and we’re thrilled to welcome them to the 89th Oscars stage." The presenters, including past Oscar® winners and nominees, are Halle Berry, Jamie Dornan, Chris Evans, Gael García Bernal, Samuel L. Jackson, Scarlett Johansson, Dakota Johnson, Shirley MacLaine, Kate McKinnon and Hailee Steinfeld. Berry won an Oscar for Actress in a Leading Role for "Monster’s Ball" (2001). Her feature credits also include "X-Men: Days of Future Past" (2014), "Cloud Atlas" (2012), "Frankie & Alice" (2010), "X-Men The Last Stand" (2006), "X2" (2003), "Die Another Day" (2002) and "X-Men" (2000). She will next appear in "Kingsman: The Golden Circle" and "Kings." Dornan’s film credits include "Fifty Shades Darker" (2017), "Fifty Shades of Grey" (2015) and the Oscar-winning film "Marie Antoinette" (2006). Additionally, he has appeared in "Anthropoid" (2016) and "The Siege of Jadotville" (2016). His upcoming films include "Fifty Shades Freed," "Robin Hood" and "Untogether." Evans is known for "Captain America: Civil War" (2016) and the Oscar-nominated features "Captain America: The Winter Solider" (2014) and "Marvel’s The Avengers" (2012). His film credits also include "The Iceman" (2013), "Puncture" (2011), "Scott Pilgrim vs. the World" (2010) and "Fantastic Four" (2005). Evans will next appear in "Gifted," "Avengers: Infinity War" and "Jekyll." García Bernal’s credits include the Oscar-winning films "Babel" (2006) and "The Motorcycle Diaries" (2004) as well as the Oscar-nominated films "Y Tu Mamá También" (2001) and "Amores Perros" (2000). Additionally, he has appeared in "Neruda" (2016), "Desierto" (2016) and "Bad Education" (2004). His upcoming films include "Z" and the animated feature "Coco." Jackson earned an Oscar nomination for Actor in a Supporting Role for "Pulp Fiction" (1994). Notably, he also appeared in the Oscar-winning films "The Hateful Eight" (2015), "Django Unchained" (2012) and "Inglourious Basterds" (2009). Jackson will next appear in "Kong: Skull Island," "The Hitman’s Bodyguard," "Avengers: Infinity War," "The Incredibles 2" and "Inversion." Johansson appeared in the Oscar-winning features "Her" (2013), "Vicky Cristina Barcelona" (2008) and "Lost in Translation" (2003) as well as the Oscar-nominated films "Iron Man 2" (2010), "Match Point" (2005) and "Girl with a Pearl Earring" (2003). Her credits also include "Captain America: Civil War" (2016) and "Lucy" (2014). Johansson will next be seen in "Ghost in the Shell," "Rock That Body" and "Avengers: Infinity War." Johnson’s credits include "Fifty Shades Darker" (2017), "Fifty Shades of Gray" (2015) and the Oscar-winning feature "The Social Network" (2010). Her other credits include "How to Be Single" (2016), "A Bigger Splash" (2015) and "Black Mass" (2015). Johnson will next appear in "Fifty Shades Freed" and "Suspiria." MacLaine won an Oscar for Actress in a Leading Role for "Terms of Endearment" (1983). Additionally, she garnered nominations for her leading roles in "The Turning Point" (1977), "Irma La Douce" (1963), "The Apartment" (1960) and "Some Came Running" (1958). She also received a Documentary Feature nomination for "The Other Half of the Sky: A China Memoir" (1975). Her notable credits also include "The Secret Life of Walter Mitty" (2013), "Bernie" (2012), "The Evening Star" (1996), "Postcards from the Edge" (1990) and "Steel Magnolias" (1989). MacLaine will next appear in "The Last Word." McKinnon’s feature credits include "Ghostbusters" (2016), "Masterminds" (2016), "Office Christmas Party" (2016) and the animated features "The Angry Birds Movie" (2016) and "Finding Dory" (2016). In addition, she has appeared in "Sisters" (2015) and "Ted 2" (2015). McKinnon will appear next in "Rock That Body." Steinfeld received an Oscar nomination for Actress in a Supporting Role for "True Grit" (2010). Her recent credits include "The Edge of Seventeen" (2016), "Ten Thousand Saints" (2015), "Barely Lethal" (2015), "Pitch Perfect 2" (2015), "Begin Again" (2014), "The Homesman" (2014) and "Ender’s Game" (2013). Steinfeld will next appear in "Pitch Perfect 3." The 89th Oscars will be held on Sunday, February 26, 2017, at the Dolby Theatre® at Hollywood & Highland Center® in Hollywood, and will be broadcast live on the ABC Television Network at 7 p.m. ET/4 p.m. PT. The Oscars, produced by De Luca and Todd and hosted by Jimmy Kimmel, also will be televised in more than 225 countries and territories worldwide. Academy Award® winners Leonardo DiCaprio, Brie Larson, Mark Rylance and Alicia Vikander will present at the 89th Oscars, show producers Michael De Luca and Jennifer Todd announced today. All return to the Oscars stage after winning last year in their respective acting categories. Hosted by Jimmy Kimmel, the Oscars will air live on Sunday, February 26, 2017 on the ABC Television Network. DiCaprio won last year for Actor in a Leading Role for “The Revenant.” He was previously nominated for his performances in “The Wolf of Wall Street” (2013), for which he also received a Best Picture nomination, “Blood Diamond” (2006), “The Aviator” (2004) and “What’s Eating Gilbert Grape” (1993). His film credits also include “The Great Gatsby” (2013), “Django Unchained” (2012) and “J. Edgar” (2011). San Francisco, CA – VIZ Media, LLC (VIZ Media), a premier company in the fields of publishing, animation distribution, and global entertainment licensing, announces the publication of the manga adaptation of The Legend of Zelda’s most famous video game with the release of THE LEGEND OF ZELDA: TWILIGHT PRINCESS on March 14th, 2017. The LEGEND OF ZELDA manga series was created by Akira Himekawa, which is the pen name of two women known simply as A. Honda and S. Nagano. The pair created The Legend of Zelda manga series which was inspired by several games and story arcs in the Zelda video game series. 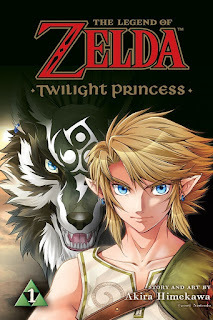 To-date they have created ten manga adventures, which are published by VIZ Media, featuring Link and the popular video game world of THE LEGEND OF ZELDA, including Ocarina of Time, Oracle of Seasons, FOUR SWORDS and more. For additional information on THE LEGEND OF ZELDA and other manga titles distributed and published by VIZ Media, please visit www.VIZ.com.